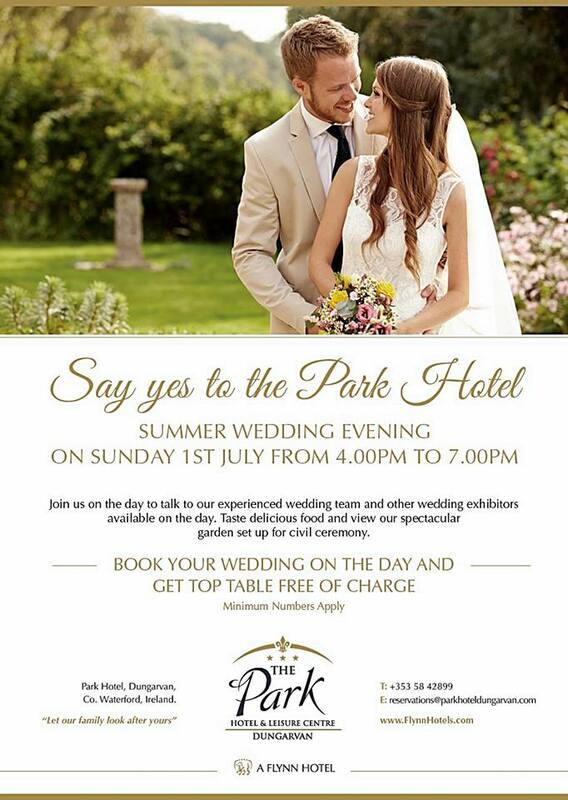 Join us on July the 1st from 4pm to talk to our experienced wedding team and other wedding suppliers that are there on the day for our event "Say Yes To The Park Hotel"! Taste delicious food and view our spectacular garden set up for a civil ceremony. You can book your wedding on the day and get the top table free of charge! We will present various display & food tables in the Ballroom and our garden setup including our new furniture. Several members of the senior team will be present to welcome you and answer any questions you might have on the day. A new winter wedding package will be revealed starting from €45 per person. Come to see one of the best Wedding venues in Waterford and enjoy the evening with us!